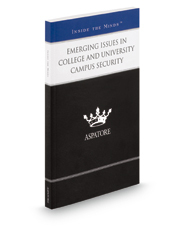 Emerging Issues in College and University Campus Security provides attorneys and education personnel with an overview of laws and regulations relating to campus security. From the first day students set foot on college and university campuses, the higher education journey brings great promise and expectation. Sadly, this same journey is often fraught with risks associated with drugs and alcohol, the use of lethal weapons, and physical/sexual assault – each of which requires colleges and universities to take steps in response to these threats. These issues become even more complex when the perpetrator or victim suffers from a disability. For campus leaders, the question is: What obligation, if any, does a college or university have to protect students from harm? This Aspatore legal title answers this and other campus security questions.